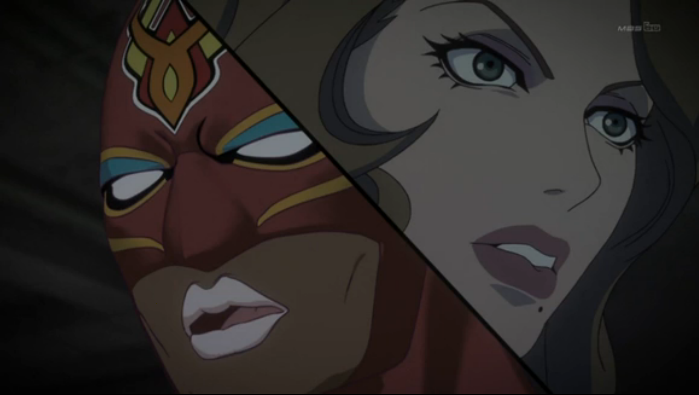 Episode 6 seems to be kicking off the first major arc for Tiger and Bunny. Up to now, we have mostly seen episodic stories that gave us a sense of the world the terrific twosome inhabit, fleshed out the characters of some of the other heroes, and gave Tiger a chance to ruffle Bunny’s feathers, err, fur. While previously the sad past of Barnaby ‘Bunny’ Brooks was hinted at, episode 6 gives us more info, including Bunny-chan’s first real clue about his parents’ murderer in a long time. The episode opens with a problem for Fire Emblem; several criminals have been murdered by intense flame, and he is suspected of the crime. Agnes, recognizing a threat to ratings when she sees one, is intent upon using Wild Tiger to clear Fire Emblem, one way or another. When another murder with the same M.O. occurs, clearing Fire Emblem, Tiger is distraught by his inability to save the life of the victim (even though the victim was a prisoner, and thus, presumably a bad guy). The murders provide a way to further expand upon Tiger’s traditional superhero values, as well as to trigger another conflict between him and Bunny, who doesn’t share Tiger’s sentimental notions. Tiger ends up walking alone at night and is attacked by a battle robot. The fight here was pretty good. The robot was mostly believable, and, since he didn’t have his armor, Tiger was only able to damage it by teaming up with Fire Emblem. The storyline was also well handled, because there were a couple of red herrings, as well as references back to earlier episodes that gave the feeling of a more significant storyline. As it turned out, there was also a tie in to Barnaby’s search for information about the murder of his parents, in the form of a tattoo of Ouroboros, the snake that swallows itself. When he sees this he snaps. The murderer turns out to be an (as yet) un-named Next (pictured above) who can shoot green flames. Is this new character a villain, or merely a vigilante who would rather kill than capture criminals? Is he associated with Ouroboros, or even the murderer of Barnaby’s parents? This certainly seems to be a set-up for a major arc, that will have a big impact on Bunny’s character. Overcooled has written that she thinks Barnaby’s back story is stereotypical of a superhero, and that is hard to deny, but I think they are doing a pretty good job with just about everything in this show, so I am excited to see them tackle a longer, more important story. I’m kind of iffy about the whole product placement thing, but I guess whatever funds anime benefits anime. 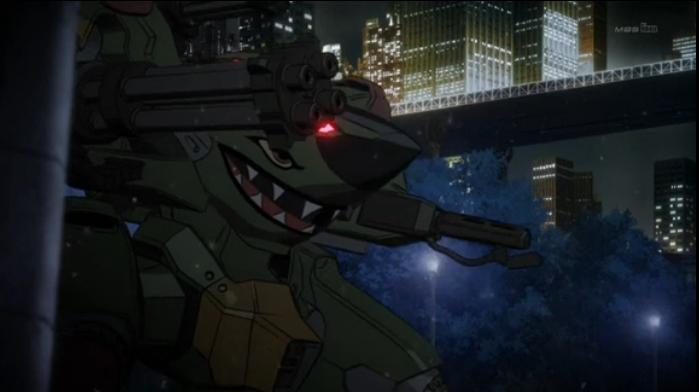 It’s cool how this anime can make mecha interesting again, it is after all, a pretty overused genre. Not that it’s a bad one, just very plentiful. I don’t mind the product placement because it seems so integrated into the storyline (or at least the setting). 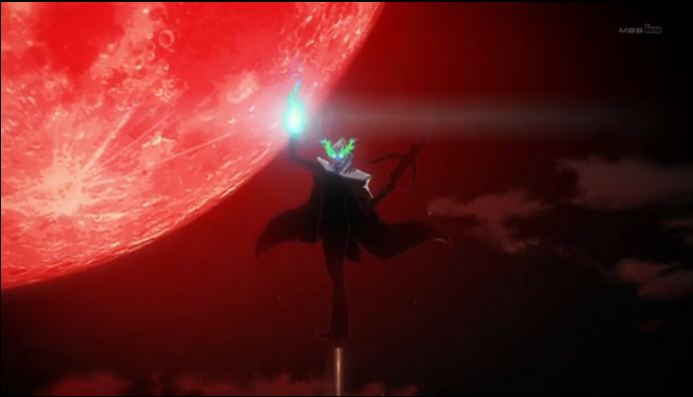 I would have liked to see more Fire Emblem in this episode, but what we got instead was just as good. 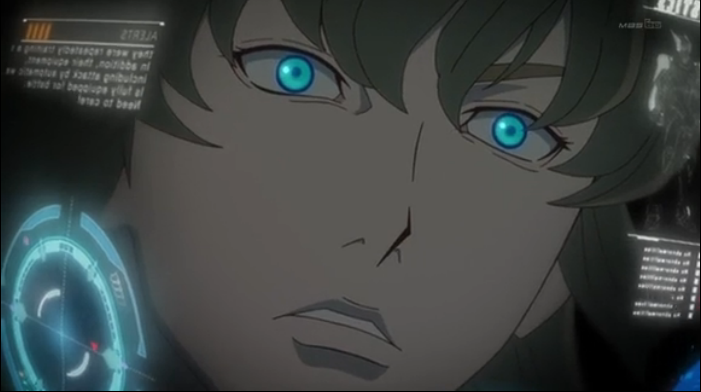 We not only saw things advance as far as Barnaby’s past/search for his parent’s killer went but I think Kotetsu’s reaction to being unable to save that prisoner hints at something deeper for his character, he seemed to be hit harder by it than you would expect him to be. So maybe something like it happened in his past. Also the new vigilante/villain is interesting, if he does turn out to be a vigilante his position as the judge in the last episode would tie into that. That said, he still seems more like villain material. That’s an interesting theory about Kotetsu’s past. I hadn’t thought of that. All we really know is that, as a kid he was pretty traumatized about his own powers. He was saying no, stay away, I’m not supposed to touch people when I’m like this. He likely hurt someone, possibly a family member. I was thinking more along the of lines that he failed to save his wife, she isn’t present and Kotetsu still wears his ring, so something must have happened to her. But it wouldn’t be hard to believe that he had a bad childhood due to how he said that, he probably did at some point and the other kids would have either been afraid of or hated him. Yeah, but we see him as a kid being afraid of his powers, so I think he might have killed a family member then. (Just a rumor! I have no knowledge of Kotetsu’s background, beyond what they have shown in the series so far). The thing I’m most interested from this episode is the potential conflict between Kotetsu and Barnaby about killing. The two of them have argued before, but there’s a difference between Kotetsu annoying Barnaby by being a huge derp and Kotetsu trying to stop Barnaby from torturing a man for info. This could make for some great storylines, and I think ruthless!Barnaby is the most interesting Barnaby. It looks like the Next in this episode is going to be a recurring antagonist, and I’d like that too since his presence seems like it could add fuel to this conflict, whoever he turns out to be. Very glad that they kept the humor this episode, too, even if it got a bit darker. T&B works really well as a comedy and I’m glad the writers aren’t going to throw it away when the plot starts to come together. You make two great points. I agree about keeping the humor, despite the serious issues about death. The conflict between Tiger & Bunny on a very serious issue was extremely interesting. I don’t know if they can maintain the serious issue (I am very confident that they can keep the show funny). The reason I don’t know if the conflict over killing can be maintained is that it seemed Bunny-chan lost it, and was acting according to his emotions in the moment, related to very personal concerns. He doesn’t have a deep-seated desire to make all criminals pay, he just puts them behind bars because that is his job. On the other hand, they did introduce the mysterious stranger, who MIGHT be a vigilante, killing criminals because he wants them dead. Tiger is obviously against that. Bunny is ambiguous. This is an interesting set-up, but we’ll have to see how they develop the story.